Manti Te'o warms up before Notre Dame's game against the Crimson Tide on Jan. 7. College football star Manti Te'o says he was the victim of a cruel hoax, an elaborate scheme in which he fell for an imaginary girlfriend named Lennay Kekua and mourned her when she died of leukemia. The narrative crafted before and after the expose is full of conflicting information and holes bigger than those in Notre Dame's defensive line during its loss to Alabama. If Te'o wants the public to believe that he was nothing more than a dupe, here are some of the questions and inconsistencies he'll need to clear up. 1. Notre Dame says that Te'o never met Kekua, that their relationship was strictly online and by phone. But the player's father gave the South Bend Tribune a detailed account of how the couple first met at a Stanford game in Palo Alto in 2009 and rendez-voused in Hawaii after becoming a couple in early 2012. And Te'o himself told ESPN that she was the "most beautiful girl I ever met." 2. Te'o called Kekua "the love of my life." His parents said they believed they would get married. Yet if Notre Dame's account is to be believed, they never met even once, or even Skyped. It beggars belief. 3. Before her leukemia "diagnosis," Kekua supposedly was nearly killed in a car accident. But published profiles of Te'o have conflicting dates -- late 2011, last January, or as recently as April. Why the discrepancies? 4. When did Kekua's fictitious death happen? Various interviews with Te'o have her succumbing to leukemia hours before his grandmother died on Sept. 12, soon after, or even days after. 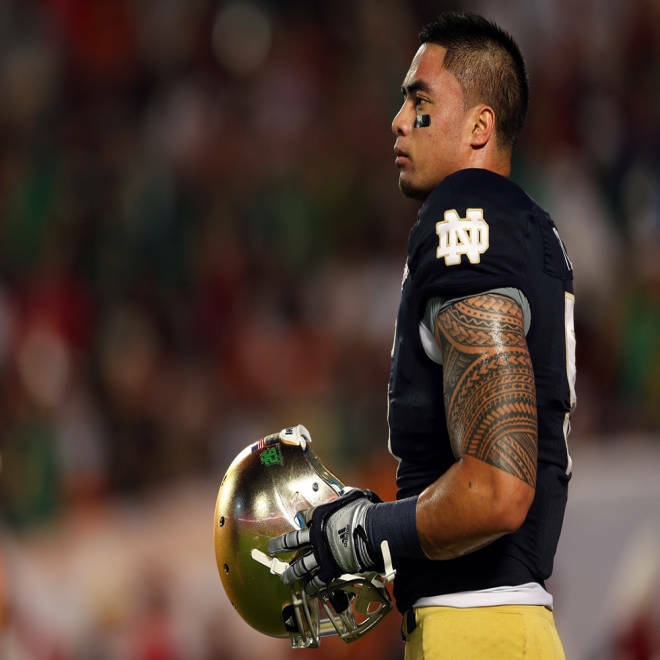 Assuming Te'o truly believed Kekua had passed away, wouldn't he remember the date? Or did all the reporters get the details wrong? 5. After he supposedly received the shock of his life -- a call from someone using Kekua's voice and phone number while he was at the ESPN Awards on Dec. 6 -- Teo stayed quiet for three weeks. It wasn't until Dec. 26 that he told Notre Dame officials, who then hired private investigators to look into it. 6. If Te'o was in on the deception, though, why wouldn't he just let Kekua rest in peace? Was he or someone else worried the hoax was about to come to light, prompting a fourth-quarter end-run to get ahead of the revelations? 7. Hours after Deadspin's bombshell report and Notre Dame's press conference, when it seemed that everyone could agree on one thing -- there is no Lennay Kekua -- an NFL player claimed to have actually seen her in the flesh. Arizona Cardinals fullback Regan Mauia said he met her in American Samoa in 2011, before she started romancing Te'o, and is "close" to her family. 8. Carrying out the hoax would have been a full-time job involving more than one person. Te'o claims he would spend all night on the phone with Kekua while she was in the hospital. There were purported communications from family members. Who would have had the time to orchestrate it? By the same token, how would Te'o have been able to create and maintain a social-media profile for Kekua on his own? 9. Where's the motive? A central figure in the hoax is reported to be musician Ronaiah Tuiasosopo. Deadspin reported that he had contact with the woman, a former high-school classmate, whose photos were used to create Kekua's profile -- even obtaining one of the pictures from her directly. But the site also describes Tuiasosopo as a friend of Te'o, raising the question of why he would humiliate his buddy. Timothy Burke, a reporter with Deadspin.com, talks about breaking the story that Notre Dame linebacker Manti Te'o's girlfriend, famously portrayed as an inspiration to him after her death this past season, was never real. Burke says it would take "a great deal of faith" to believe all of Te'o's account.